It took about 2 hours to get the furnace up to temperature (2300 deg F) to melt the scrap cast iron. Normally it takes just over an hour but we think that either the bottom of the furnance had a buildup of slag which affected the air mixture or maybe the burner was wearing out. 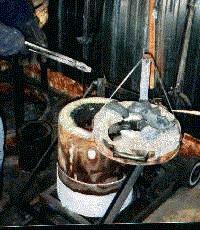 The top of the furnace swivels over and scrap cast iron is placed into the furnace. As the first cast is melting the next batch is preheating on top. 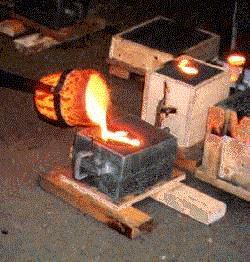 This furnace can melt about 20-25 lbs at a time. When the furnace runs, it sounds like a jet engine. The burner swirls the flame around the inside and out of the top. As it reaches temperature, everything inside the furnace is glowing a medium red. 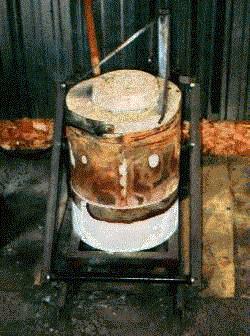 A hardwood cue stick was used to stir the melted iron and test if it was completely melted. Notice the protection that Rupert is wearing in the above picture. 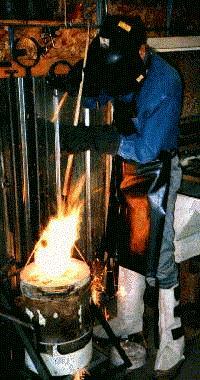 He has steel toed work boots on, leather chaps, a leather apron, leather gloves and he's wearing a welder's mask with a mild dark lens in place. The hardwood cue stick instantly bursts into flames! When the sand castings are completed, the risers and sprues are covered to prevent insects from crawling into them. It sounds silly, but the moisture content in one housefly is enough to create sufficient steam pressure to blow the molted metal back out the riser to the ceiling! I certainly don't want to be near my own minature active volcano. When the cast reached pouring temperature, the complete body of the furnace is raised (too bad I didn't get a picture of this!). Everybody backs off a safe distance cause lots of sparks fly from the ceramic crucible. Long tongs are used to pick up the crucible and carry it. By the way, most of the floor is dirt and where the furnace is has steel plate to stand on. 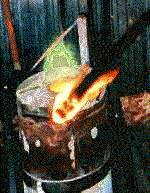 Notice how glowing red the crucible is and the molten iron. That's what 2300 deg F looks like! Compare the color to pouring aluminum from the pictures on my cast aluminum mirror bracket pages. It takes about 2 beers (foundry time measurement system I understand) for the iron to cool enough to remove from the moulds. 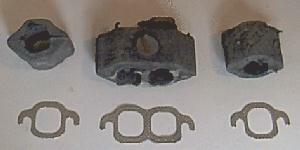 The pieces are very rough looking and need to be sandblasted to get the green sand off before machining. The machining of the spacers was not too difficult. As a matter of fact it went much better than I expected. I used a 6" hand grinder to grind off the excess flash and then set up each piece in a 4 jaw lathe. 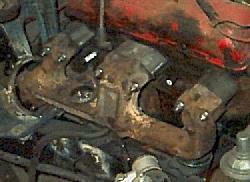 The most important part of machining the pieces is that the exhaust manifold and head sides be parallel. I centered the first piece and faced the first side. Next I flipped the piece over and two of the jaws so that there was a flat side on the jaws to fit flush against. Faced the second side and I was done. Just had to drill the mounting holes from the dimensions that I had.